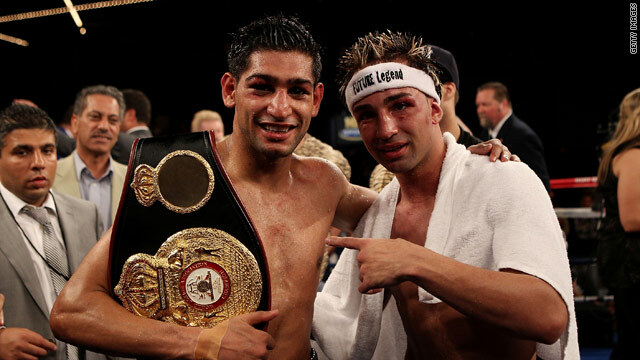 Despite bad blood beforehand, there was mutual respect after Amir Khan had beaten Paulie Malignaggi to defend his world title. (CNN) -- British world champion Amir Khan retained his World Boxing Association (WBA) light-welterweight title on Saturday night with a clinical stopppage victory over challenger Paulie Malignaggi at Madison Square Garden, New York. The 23-year-old Khan, who was making his big-fight debut on American soil, impressed throughtout with his speed and power before eventually stopping his opponent in the 11th round of the 12-round contest. Khan, who was ahead on all three of the judges scorecards when the referee stopped the fight one minute and 25 seconds into the round, improves his record to 23-1, while Malignaggi -- who lost to Khan's compatriot Ricky Hatton in 2008 -- was slumping to the fourth defeat of his career. There had been bad blood between both fighters and their respective camps in the lead-up to the contest, including a scuffle during the weigh-in, but the actual bout passed off without any incidents of that nature. Former Olympic silver medallist Khan told ESPN: "I'm making 140lb easy, I feel strong. "I'm not leaving 140lb until I unify the title. Until I'm number one I'm not going to leave this division." "We stuck to the game plan, we knew Paulie is a very awkward fighter, he's a great boxer, great at moving. "We had to break him down slowly, we didn't want to run in there trying to knock him out because we would have got caught with shots. I knew in the last few rounds I was hurting him and all I had to do was put the pressure on him."